There is no economic reason for Carbon Sequestration without Carbon Markets. To make significant reductions in greenhouse gas (GHG) emissions by mid-century, large-scale reduction opportunities, including CCS, will be needed. CCS is an important wedge to keep C02 in the atmosphere to an acceptable level. 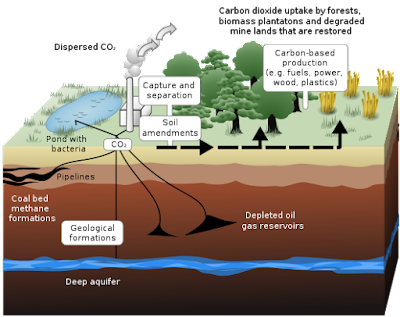 CCS - Carbon Capture and Storage is a broad term that encompasses a number of technologies that can be used to capture CO2 from point sources, such as power plants and other industrial facilities; compress it; transport it mainly by pipeline to suitable locations; and inject it into deep subsurface geological formations for indefinite isolation from the atmosphere. CCS is a critical option in the portfolio of solutions available to combat climate change, because it allows for significant reductions in CO2 emissions from fossil-based systems, enabling it to be used as a bridge to a sustainable energy future. 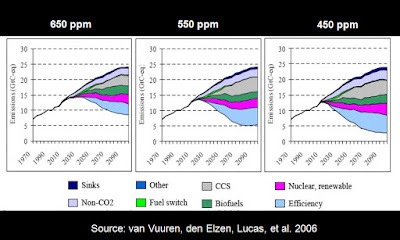 Stabilizing climate-forcing emissions suggest atmospheric CO2 stabilization can only be accomplished through the development and deployment of a robust portfolio of solutions, including significant increases in energy efficiency and conservation in the industrial, building, and transport sectors; increased reliance on renewable energy and potentially additional nuclear energy sources; and deployment of CCS. Pipelines are the dominant mode of transporting CO2. In the United States there is an estimated 3,900 miles of CO2 pipelines transporting CO2 for enhanced oil recovery operations. Tanker and ship CO2 transportation is mainly found in the food and beverage industries. About 100,000 tons of CO2 are transported annually for these industries—far less than the amounts expected to be associated with a commercial-scale power plant, or even ethanol, cement, or natural gas refining output. The advantage of pipeline transportation of CO2 is that it can deliver a constant and steady supply of CO2 without the need for intermediate storage along a distribution route. Ship transportation of large quantities of CO2 may be feasible when it needs to be transported over long distances or overseas; however, many anthropogenic CO2 sources are located far from navigable waterways, so such a scheme will still most likely require pipeline construction between CO2 sources and port terminals. Biochar - also known as Terra preta - Charcoal created by pyrolysis of biomass, and differs from charcoal that its primary uses are carbon sequestration or Bio-energy with carbon capture and storage, can improve water quality, increase soil fertility, raise agricultural productivity and reduce pressure on old-growth forests. Biochar is a stable solid rich in carbon content, and thus, can be used to lock carbon in the soil. Biochar is of increasing interest because of concerns about climate change, thus creating biochar breaks into the carbon dioxide cycle with carbon sequestration. Biosequestration - Carbon sequestration through biological processes affects the Global carbon cycle. Examples include major climatic fluctuations, such as the Azolla event, which created the current Arctic climate. Such processes created fossil fuels, as well as clathrate or limestone. By manipulating such processes, geoengineers seek to enhance sequestration. Confining Zones - must be present and must prevent the injected or displaced fluids from migrating to drinking water sources as well as to economic resources (e.g., mineral resources) or the surface. Carbon Dioxide flooding can be an ideal tertiary recovery method. It is particularly effective in reservoirs deeper than 2,000 ft., where CO2 will be in a supercritical state. Geosequestration - Involves liquifying carbon dioxide and depositing it into mineral zones below the earth's surface where chemical reactions of the liquid CO2 with minerals stabilise it in solid form. Mineral sequestration aims to trap carbon in the form of solid carbonate salts. This process occurs slowly in nature and is responsible for the deposition and accumulation of limestone over geologic time. Carbonic acid in groundwater slowly reacts with complex silicates to dissolve calcium, magnesium, alkalis and silica and leave a residue of clay minerals. The dissolved calcium and magnesium react with bicarbonate to precipitate calcium and magnesium carbonates, a process that organisms use to make shells. When the organisms die, their shells are deposited as sediment and eventually turn into limestone. Limestones have accumulated over billions of years of geologic time and contain much of Earth's carbon. Ongoing research aims to speed up similar reactions involving alkali carbonates. Several serpentinite deposits are being investigated as potentially large scale CO2 storage sinks such as those found in NSW, Australia, where the first mineral carbonation pilot plant project is underway. Beneficial re-use of magnesium carbonate from this process could provide feedstock for new products developed for the built environment and agriculture without returning the carbon into the atmosphere and so acting as a carbon sink. One proposed reaction is that of the olivine-rich rock dunite, or its hydrated equivalent serpentinite with carbon dioxide to form the carbonate mineral magnesite, plus silica and iron oxide (magnetite). Serpentinite sequestration is favored because of the non-toxic and stable nature of magnesium carbonate. The ideal reactions involve the magnesium endmember components of the olivine (reaction 1) or serpentine (reaction 2), the latter derived from earlier olivine by hydration and silicification (reaction 3). Reaction 4 - The presence of iron in the olivine or serpentine reduces the efficiency of sequestration, since the iron components of these minerals break down to iron oxide and silica. Iron Fertilization - Ocean iron fertilization is a geoengineering technique that attempts to encourage phytoplankton growth, which removes carbon from the atmosphere for at least a period of time. This technique is controversial due to limited understanding its complete effects on the marine ecosystem, including side effects and possibly large deviations from expected behavior. Such effects potentially include release of nitrogen oxides, and disruption of the ocean's nutrient balance. MMV - Measurement Monitoring, and Verification - MMV requirements should not prescribe methods or tools; rather, they should focus on the key information an operator is required to collect for each injection well and the overall project, including injected volume, flow rate or injection pressure, composition of injectate; spatial distribution of the CO2 plume, reservoir pressure, well integrity, determination of any measurable leakage and appropriate data (including formation fluid chemistry) from the monitoring zone, confining zone, and underground sources of drinking water (USDWs). Saline Formations - Layers of porous rock that are filled with saltwater. Far more extensive than oil- and gas-bearing formations are saline formations, saline formations represent the largest CO2 storage opportunity, the equivalent of hundreds of years of the region’s man-made CO2 emissions. Saline formations have been little studied because they do not contain hydrocarbons. However, three major CO2 injections into saline formations for storage are ongoing, two in offshore areas near Norway (by Statoil) and the other at In Salah in Algeria (a joint venture by BP, Sonatrach, and Statoil). Results from these projects and similar smaller projects suggest that saline formations can serve as reliable, long-term CO2 storage sites. Nonetheless, more field demonstrations are being undertaken to ascertain real-world site management needs and costs across a variety of locations. Supercritical Fluid - Any substance at a temperature and pressure above its critical point, where distinct liquid and gas phases do not exist. It can effuse through solids like a gas, and dissolve materials like a liquid. In addition, close to the critical point, small changes in pressure or temperature result in large changes in density, allowing many properties of a supercritical fluid to be "fine-tuned". The most efficient way to transport CO2 is in a supercritical phase. The critical point at which CO2 exists in a supercritical phase is 1,070 psi (73 atmospheres (atm)) and 88oF (31oC) CO2 is generally transported at temperature and pressure ranges between 55oF and 110oF and 1,250 psi (85 atm) and 2,200 psi (149.6 atm), respectively. The upper pressure limit is mostly due to economic concerns, and is set to the ASME-ANSI 900# flange rating (the maximum pressures for ANSI 900# flange is material dependent). The lower pressure limit is set by the phase behavior of CO2, and should be sufficient to maintain supercritical condition. The upper temperature limit is determined by the compressor-station discharge temperature and the temperature limits of the external pipeline coating material. The lower temperature limit is set by winter ground temperature. It is important for operators to maintain single-phase flow in CO2 pipelines by avoiding abrupt pressure drops. present in the CO2 stream, it may not be possible to practically produce a supercritical fluid. UIC - Underground Injection Control - Administered by the U.S. Environmental Protection Agency (EPA), the UIC Program is responsible for regulating the construction, operation, permitting,and closure of injection wells that place fluids underground for storage or disposal. EPA’s regulations group injection wells into six groups or “classes,” including the new Class VI geologic sequestration class. Congress amended the SDWA in 2005 to exclude hydraulic fracturing, an industrial process for recovering oil and natural gas, from coverage under the UIC program. Class I UIC well: Permitted under the Underground Injection Control Program, Class I wells inject hazardous and nonhazardous wastes into deep, isolated rock formations that are thousands of meters below the lowermost underground source of drinking water. Class I wells are classified as hazardous, nonhazardous industrial, municipal, orradioactive, depending on the characteristics of the fluid injected. The construction, permitting, operating, and monitoring requirements are more stringent for Class I hazardous wells than for the other types of injection wells. There are approximately 550 Class I wells in the United States. Class II UIC well: Permitted under the Underground Injection Control Program, Class II wells inject fluids associated with oil and natural gas production. Most of the injected fluid is salt water, which is brought to the surface in the process of producing oil and gas. In addition, brine and other fluids (including carbon dioxide) are injected to enhance oil and gas production. There are approximately 144,000 Class II wells in operation in the United States, which collectively inject over 2 billion gallons of brine every day. USDW - Underground sources of drinking water - An aquifer or portion of an aquifer that supplies any public water system; or that contains a sufficient quantity of groundwater to supply a public water system, and currently supplies drinking water for human consumption; or that contains fewer than 10,000 milligrams per liter of total dissolved solids and is not an exempted aquifer. Scientific investigation and technical knowledge can provide the basis for safe and effective injection of CO2 into specific geologic formations for long-term storage, keeping it isolated from drinking water supplies and preventing release to the atmosphere. Existing monitoring techniques are capable of measuring the amount of CO2 injected, and delineating the project footprint after injection. These monitoring techniques can be applied using a risk-based strategy to ensure that sensitive populations and environments are safeguarded. New monitoring techniques can improve the effectiveness and/or reduce the cost of detection and tracking. Injected CO2 is more permanently trapped in the subsurface over time, as storage mechanisms reduce CO2 mobility and, ultimately, virtually eliminate the potential threat to drinking water supplies and the atmospheric climate. The relative risks associated with a project finally decline over time as the pressure of the injection CO2 stabilizes or reaches background levels and other trapping measures take place. Contingent mitigation/remediation planning can be applied in advance of project initiation and updated throughout operations to ensure that any unexpected and undesired movement of injected CO2 will be detected early, and if detected, addressed as needed. In the United States, there is the technical potential to sequester hundreds of billions of tons of CO2 in saline formations and oil and gas fields that are located reasonably near large sources of anthropogenic CO2. Globally, there is a conservatively estimated technical potential of at least 2,000 GtCO2 [Gigatons of carbon dioxide] of storage capacity in geological formations, including saline, oil and gas formations, coal seams (potentially), and other formations. The final volumes of "proven" storage reserves may be significantly smaller than the technical potential, but are still likely to be very large. The emerging CCS industry benefits from the significant knowledge and best practices developed during over 35 years of CO2 EOR. Because geologic storage will include new requirements, it is important to acknowledge that a significant amount of new technological learning and advancement is expected over time. With experience, the best practices for storage will evolve. Fossil fuels are considered the most dependable, cost-effective energy source in the world. The availability of these fuels to provide clean, affordable energy is essential for domestic and global prosperity and security well into the 21st century. However, a balance is needed between energy security and concerns over the impacts of concentrations of greenhouse gases (GHGs) in the atmosphere – particularly carbon dioxide (CO2). Geologic Capacity - Geological formations are currently considered the most promising sequestration sites. The National Energy Technology Laboratory (NETL) reported that North America has enough storage capacity at its current rate of production for more than 900 years worth of carbon dioxide. Very Long timeframes Required - Long term predictions about submarine or underground storage security are very difficult and uncertain, and there is still the risk that CO2 might leak from the storage into the atmosphere. The trapping mechanisms in the geological formations being considered for sequestration have stored reservoirs of oil and gas for millions of years. Research and pilot projects have shown that CO2 is highly likely to remain sequestered in well-selected and managed sites. Several pilot and demonstration projects have been sequestering carbon for over a decade, and monitoring systems have not detected any leakage. Drinking Water Contamination - If CO2 gets into shallow freshwater aquifers, small amounts of trace metals will be freed from the rock volume. In a laboratory experiment, researchers exposed the experimental water samples to a flow of CO2 designed to simulate a slow leak and observed chemical changes that occurred over the course of more than 300 days. The CO2 caused the pH of the water in all the samples to drop 1–2 units as the gas reacted with the water to form carbonic acid. The drop in pH caused the rock in the samples to weather, increasing the concentration in the water of elements that had been previously part of the rock. Although the specific chemical changes depended on the unique geochemistry of each sample’s respective site, the authors report that on the whole, CO2 caused concentrations of alkali and alkali earth elements, as well as manganese, cobalt, nickel and iron, to increase—in some cases by more than two orders of magnitude. Concentrations of aluminum, manganese, iron, zinc, cadmium, selenium, barium, thallium and uranium in some samples neared or exceeded maximum contaminant levels set by the EPA. Underground carbon sequestration is regulated under the Safe Drinking Water Act of 1974, which states that groups can't inject anything underground if there is even a small chance it might contaminate usable drinking water sources above the thresholds mandated by the EPA. The drinking water act divides wells into different classes depending on the depth at which the material is to be injected, whether or not it’s hazardous and other distinguishing factors. On November 22, the EPA finalized regulations for Class VI wells, a category designed specifically for underground CO2 sequestration. According to the press release, "The rule requirements are designed to ensure that wells used for geologic sequestration of carbon dioxide are appropriately sited, constructed, tested, monitored, and closed." In August 2011, the EPA proposed a rule to advance the use of CCS technologies. The proposal will exclude from EPA’s hazardous waste regulations CO2 streams that are injected for geologic sequestration in wells designated for this purpose under the Safe Drinking Water Act. The EPA is proposing this exclusion as part of the agency’s effort to reduce barriers to the use of CCS technologies. EPA requests that comments submitted on the rule share analytical data on the overall composition of captured CO2 streams, including physical and chemical characteristics, to help the Agency determine if additional actions are necessary to ensure the safe use of CSS technologies. Based on a review of existing regulatory programs, EPA’s proposal concludes that the management of CO2 streams under the proposed conditions does not present a substantial risk to people’s health or the environment, provides regulatory certainty to industries considering the use of CCS technologies, and encourages the deployment of CCS technologies in a safe and environmentally protective manner. Co-Constituents - When CO2 is captured from power plants, it contains water. When combined with water, CO2 forms carbonic acid that has the potential to corrode pipelines (it is possible, but significantly more expensive, to construct pipelines that are resistant to this corrosion). The captured CO2 can also contain hydrogen sulfide (H2S). Facility operators will have to dry the CO2, remove co-constituents, and compress it into a supercritical phase before it leaves the facility. Dehydration is particularly important when sulphur is present because H2S reacts with water to form sulfuric acid, which is highly corrosive and may also result in pipeline cracking, increasing the potential for leaks. The potential issues or impacts associated with underground injection of co-constituents are not clearly defined due to lack of actual demonstration. Mercury is present in coal and is a natural byproduct of the combustion process; it could condense in the pipeline system and create operational issues as well as implications for storage.Given the uncertainty, it is not technically or economically feasible to prescribe any standards or give guidelines for CO2 composition. Ocean Acidification - Deep ocean storage, there is a risk of greatly increasing the problem of ocean acidification, an issue that also stems from the excess of carbon dioxide already in the atmosphere and oceans. Fracking of Shale May Impair Carbon Storage Projects - The fracturing of shale rock formations associated with the drilling process known as fracking might undermine future attempts to store carbon dioxide underground, according to a new study. While many have called carbon storage a promising solution to reducing atmospheric levels of greenhouse gas emissions — by essentially pumping captured CO2 into deep, permeable geological formations — Princeton University researcher Michael Celia says that process would only work if there is a layer of impermeable caprock to prevent the CO2 from escaping. 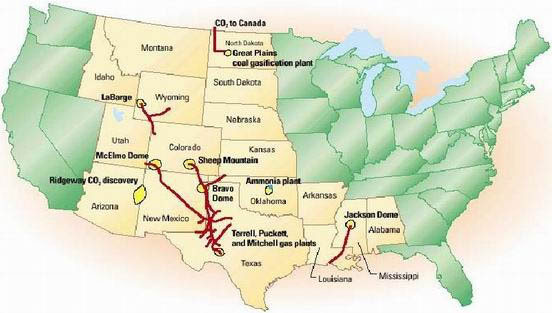 But according to his study, published in the journal Environmental Science & Technology, , about 80 percent of the U.S. areas suited for carbon storage overlap with regions of potential shale-gas production. The hydraulic fracturing of those shale-gas areas involves blasting a mixture of water, sand, and chemicals deep underground to shatter the shale formations and free the natural gas trapped within. While it is unclear how much of the potential storage volume would be lost, shale gas drilling could “significantly affect” the sequestration capacity for carbon storage operations, the study said. Low-risk sites should be prioritized for early projects. Saline formations and mature oil and gas fields should be considered for initial projects. Other formations, such as coal seams, may prove viable for subsequent activity with additional research. Considering the extent of CO2 pipeline needs for largescale CCS, a more efficient means of regulating the siting of interstate CO2 pipelines should be considered at the federal level, based on consultation with states, industry, and other stakeholders. As a broader CO2 pipeline infrastructure develops, regulators should consider allowing CO2 pipeline developers to take advantage of current state condemnation statutes and regulations that will facilitate right-of-way acquisition negotiations. The federal government should consult with industry and states to evaluate a model for setting rates and access for interstate CO2 pipelines. Such action would facilitate the growth of an interstate CO2 pipeline network. Based on site-specific risk assessment, project operators/owners should provide an expected value of the estimated costs of site closure (including well plugging and abandonment, MMV, and foreseeable mitigation (remediation) action) as part of their permit application. These cost estimates should be updated as needed prior to undertaking site closure. As a condition of completing site closure, operators should provide data on plugged and abandoned wells potentially affected by their project to the appropriate well plugging and abandonment registry. This would include the location and description of all known wells in the storage project footprint, and the drilling, completion, plugging, and integrity testing records for all operational well. Certified closed sites should be managed by an entity or entities whose tasks would include such activities as operating the registries of sites, conducting periodic MMV, and, if the need arises, conducting routine maintenance at MMV wells at closed sites over time. In August, 2010, the DOE announced a retooling of the FutureGen project, dubbed FutureGen 2.0. The revised plan includes retrofitting a shuttered coal-fired power plant in Meredosia, Illinois to demonstrate advanced oxy-combustion technology, and piping the carbon dioxide 175 miles to Mattoon for underground storage. Due to these changes, leaders in Mattoon decided to drop out of the FutureGen project. In February 2011, Morgan County was chosen for the sequestration site. Construction on the power plant and carbon dioxide storage site is expected for spring 2013. Salah CO2 Injection — Northern Africa A fully operational onshore gas field with CO2 injection. CO2 is separated from produced gas and reinjected in the producing hydrocarbon reservoir zones. Since 2004, about 1 Mt/a of CO2 has been captured during natural gas extraction and injected into the Krechba geologic formation at a depth of 1,800m. Snøhvit CO2 Injection — Norway A fully operational offshore gas field with CO2 injection. The LNG plant is located onshore. CO2 is separated from produced gas and injected in a saline aquifer below the H/C reservoir zones offshore. This liquefied natural gas (LNG) plant captures 0.7 Mt/a of CO2 and injects it into the Tubåen sandstone formation 2,600m under the seabed for storage. Weyburn Operations — Canada The oil field is currently operating while injecting CO2 to increase oil production. This project captures about 2.8 Mt/a of CO2 from Dakota Gasification Company's (Dakota Gas) Great Plains Synfuels Plant. This coal gasification plant located in North Dakota, transports CO2 by pipeline 320 km across the Canadian border and injects it into depleting oil fields where it is used for enhanced oil recovery (EOR). Dakota Gas exports about 152 million cubic feet per day of CO2 to Canada – about 50 percent of the CO2 produced when running at full rates. As of Dec. 31, 2010, Dakota Gas has captured more than 20 million metric tons of carbon dioxide. SACROC - Scurry Area Canyon Reef Operators Committee. A carbonate reef complex in the Permian Basin of west Texas. SACROC is the oldest carbon dioxide-enhanced oil recovery site in the United States, with CO2 injection since 1972. More than 175 million tons of CO2 have been injected in SACROC. Salt Creek Enhanced Oil Recovery — USA Anadarko Petroleum Corporation will build a pipeline to inject CO2 in existing Salt Creek Oil Field for enhanced oil recovery. Anadarko has injected 5.12 billion cubic metres of carbon dioxide into the field as part of a project to tease more oil from the field and in the process sequester a greenhouse gas that would otherwise have to be discharged into the atmosphere. Enid Fertilizer — USA sends 675,000 tonnes of CO2 to be used for EOR. The pipeline and wells are operated separately by Anadarko Petroleum. Archer Daniels Midland - (NYSE: ADM) - Broke ground in August 2011 building the first large-scale industrial carbon capture and storage (ICCS) facility in the U.S. in Decatur, Illinois. With $141 million in funding from the 2009 ARRA economic stimulus legislation, the project looks to capture and store one million tons of CO2 per year produced from turning corn into ethanol fuel from the nearby Archer Daniels Midland biofuels plant. The ADM project is designed to store approximately 2,500 metric tons of carbon dioxide per day in the saline Mount Simon Sandstone formation at depths of approximately 7,000 feet. The plant is supposed to be in operation in late summer 2013. FutureGen Industrial Alliance - Formed to partner with the U.S. Department of Energy on the FutureGen project. It is a non-profit membership organization created to benefit the public interest, and the interests of science through research, development and demonstration of near-zero emissions goal technology. The FutureGen Industrial Alliance is a consortium of 10 power producers and electric utilities from around the globe. 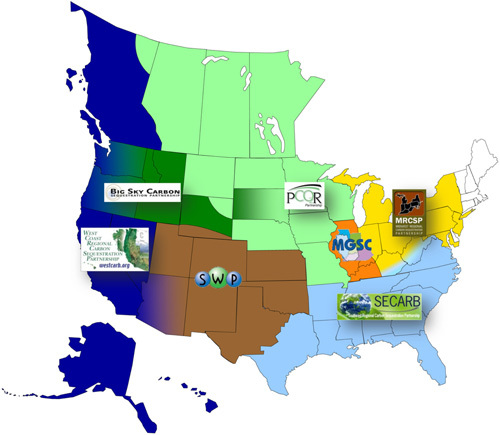 Regional Carbon Sequestration Partnerships - In 2003, the DOE awarded cooperative agreements to seven Regional Carbon Sequestration Partnerships (RCSPs). The seven RCSPs are tasked to determine the best geologic and terrestrial storage approaches and apply technologies to safely and permanently store carbon dioxide (CO2) for their specific regions. Geographical differences in fossil fuel use and storage opportunities across North America dictate regional approaches to storage of CO2 and other greenhouse gases. The RCSPs are public/private partnerships comprised of more than 400 organizations covering 43 states and four Canadian provinces. The RCSPs include representatives from state and local agencies, regional universities, national laboratories, non-government organizations, foreign government agencies, engineering and research firms, electric utilities, oil and gas companies, and other industrial partners. Each of the RCSPs are led by one organization that manages the RCSP activities, including the characterization efforts, planning and leading the small- and large-scale injection tests, and integrating the results. The RCSP Program has been implemented in three interrelated phases. regional geologic data on CO2. Characterization Phase, the seven RCSPs identified the most promising opportunities for CCS projects in their Regions and are conducting 21 geologic field tests). In addition, the RCSPs are verifying regional CO2 sequestration capacities, satisfying project permitting requirements, and conducting public outreach and education activities. The Development Phase (FY 2008 – FY 2017+). Will establish at large scale that CO2 capture, transport, injection, and storage can be achieved safely, permanently, and economically. Tests during the Development Phase will address practical issues, such as sustainable injectivity, well design for both integrity and increased capacity, and reservoir behavior with respect to prolonged injection. Regional variations among the RCSPs will provide vitally important information and experience as they test injection and monitoring technologies in a variety of geologic settings at scale. BSCSP - Big Sky Carbon Sequestration Partnership - Montana State University - Bozeman - The primary goal of the Basalt Pilot is to conduct a small scale carbon sequestration project in deep basalts of the Columbia River Basalt Group (CRBG). The research is one of the first projects in the world to assess the viability and capacity of deep basalt formations as an option for geologic sequestration. MGSC - Midwest Geological Sequestration Consortium - Illinois State Geological Survey - The Illinois basin is an oval depression covering approximately 60,000 mi2 (155,000 km2) in the U.S. Mid-Continent. The basin contains about 100,000 mi3 (450,000 km3) of Cambrian through Permian sedimentary rocks. These rocks consist primarily of marine carbonates and, to a lesser extent, sandstone, shale, and siltstone. Paleozoic rocks disconformably overlie Precambrian granite and rhyolite, dated between 1,420 and 1,500 Ma. SECARB - Southeast Regional Carbon Sequestration Partnership - Southern States Energy Board. Schlumberger Carbon Services - Specializes in the storage of CO2, deploying the geology, engineering and measurement expertise built up over 80 years in the oil and gas industry. Our technologists and scientists have adapted and extended our portfolio of specialist tools, techniques and software to lead the development of underground CO2 storage. Schlumberger Limited has principal offices in Paris, Houston and The Hague and reported revenues of $22.7 billion in 2009. Pipelines are indeed very helpful in transporting any kind of element/compound. It includes either fluid or gas. It is very important to install the pipeline properly to prevent leakage.